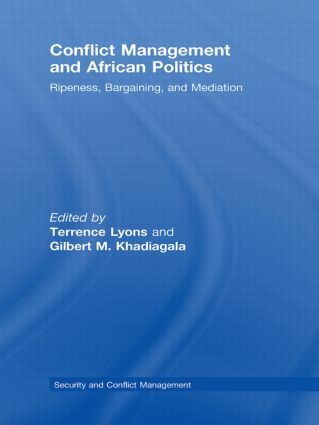 This edited volume builds on a core set of concepts developed by I. William Zartman to offer new insights into conflict management and African politics. Key concepts such as ripe moments, hurting stalemates, and collapsed states, are built upon in order to show how conflict resolution theory may be applied to contemporary challenges, particularly in Africa. The contributors explore means of pre-empting negotiations over bribery, improving outcomes in environmental negotiations, boosting the capacity of mediators to end violent conflicts, and finding equitable negotiated outcomes. Other issues dealt with in the book include the negotiation of relations with Europe, the role of culture in African conflict resolution, the means to enhance security in unstable regional environments, and the strategic role of the United States in mediating African conflicts. This book will be of much interest to students of international conflict management, peace/conflict studies, African politics and IR in general. Post-cold war conflict in West Africa: A subordinate state system in collapse? African conflict “Medicine”: An emerging paradigm shift in African conflict resolution?